ICEFA Lidice was established in 1967 to commemorate the child victims from the Czech village of Lidice who were killed by Germans in 1942, as well as all other children who have died in wars. The exhibition is organized annually by the Lidice Memorial with the support of Czech Ministry of Culture, Ministry of Foreign Affairs, Ministry of Education, Youth and Sports and the Czech Commission for UNESCO. The exhibition is a competition with a long tradition not only in the Czech Republic, but all over the world. The contest participants include children, pupils and students, aged 4 to 16. The theme of each year is declared annually. The main topics include everything relating to children, whatever shapes up their world, what makes them suffer and what they enjoy, including their interests, dreams, desires, the environment, etc. This year marks the 10th anniversary of a universal agreement on the protection of folk arts, crafts, rituals and traditional folk knowledge -- the Convention for the Safeguarding of the Intangible Cultural Heritage. On the occasion of this anniversary, the Czech Commission for UNESCO offered for the 41st edition of the international exhibition the theme "The traditions and heritage of the people of my country" with such subtopics as traditional clothes, dancing, rustic wedding, folk customs, rituals and traditions. 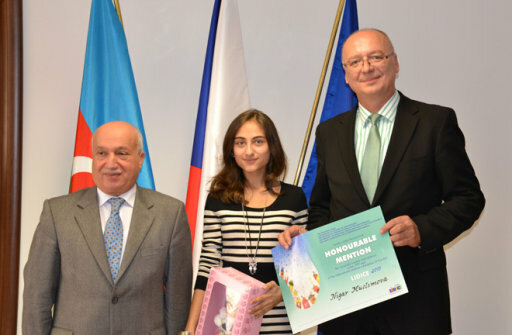 The interest of young Azerbaijani artists in ICEFA Lidice is traditionally high. The professional jury awarded five works out of the entries of 387 registered members from Azerbaijan in such categories as drawing and painting. Four works were awarded with a certificate of appreciation and one with the main prize, Rose of Lidice medal. Czech Ambassador to Azerbaijan Radek Matula said at the event that for Azerbaijan the theme "The traditions and heritage of the people of my country" was just one of the most suitable ones as Azerbaijan is a country with abundant history and traditions. He said that teachers have considerable merits in the creative achievements of the children. "It is clear that the teacher's personality, skills, knowledge, enthusiasm and responsibility for the children's results are very important factors," he said. Matula also congratulated the parents of students who support their children's artistic capabilities. In recent years, the mentioned exhibition regularly features about 25,000 individual artworks of children from 60 to 70 countries. The jury selects the most successful works and awards diplomas and a commemorative medal. The awarded works are displayed in the Lidice Gallery of the Lidice Memorial. After the main exhibition in Lidice the exhibits are showcased in the halls and galleries in the Czech Republic and abroad.